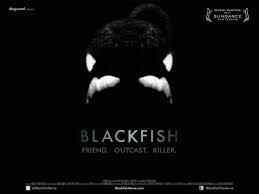 BlackFish…..An Eye Opener to us all. During the Christmas Vacation, I came across this documentary film called “Black Fish”. This documentary was a real eye opener to all animal lovers. The documentary explains and shows how these wonderful “Mammals” were capture and some even killed for the better good of mankind to bring them to our Water Themes Parks, Like SeaWorld of Orlando Florida, and Miami Seaquarium for the exploitation and amusement of us all. The film runs about short of 1 hour long, but it keeps you in your seat and you are totally moved by all the information you are receiving. It rises the question, are we doing good or are we doing evil in having these Orcas in captivity. It opens your eye to the injustice these animal face everyday and how these trainers are exposed to these Killer Whales with no apparent knowledge or education on how to work with them. Then there is the other side of the coins, as these major corporation, give valid reason to their believe, they are doing good and not harm and bringing educational awareness to the public about the whales. Their arguments consist that is “human error” and not the whales that should be blame for the misfortune and death of these trainers, especially in the case of Ms. Dawn Brancheau. I for one, do believe Ms. Bracheau loved her job and was very well experience, being at SeaWorld for so long on how to work with the Killer Whales. Her death was a very tragic, and horrific ending to a beautiful person, who truly believe and trusted the animals she was taking care of. These animals are social creatures, that is how they co-exist in the open waters. They lives in Pods with their families for life. They are very loving and helpful to one another. Having them isolated in tank for a very long period of the day, can and will be frustrating. They will become psychotic, and will go simply mad and aggressive to themselves and others around them. I can not make up your mind, or help you take side on who is right or wrong, however; as a journalist, I can help you be aware of your environment around you. If you are interested to learn more about these beautiful creatures of the Wild Open Sea, I have enclosed more links for you.